edit an ad group if you want to rename it, edit the schedule or budget, or edit the audience. delete an ad group you no longer need. From the Yahoo Native & Search Campaigns tab, select the link for the campaign associated with the ad group you want to edit. Select the Ad Groups subtab. Select the ad group you want to edit. In the Bid and Settings area, you name your ad group, set the dates you want the ads within your ad group to run, and set the amount you are willing to pay on a Cost Per Click (CPC) or Cost Per View (CPV) basis. Type a name for your ad group. Set the schedule. Do one of the following: - Select Start running ads immediately. - Select Set a start and end date, and then select the dates you want the ad group to run. For bidding, do the following: - If you want to bid the same amount for native and search ads, set a cost per click (CPC) price. - If you want to bid different amounts for native and search ads, click Show advanced settings, move the Set separate bids for native and search ads slider to the right, and and enter separate CPC amounts for each ad type. Defining your audience tells Yahoo Native & Search the types of people you to whom you want your ad to serve. If you want to use your campaign-level settings, you can skip this section. If you do not want to use your campaign-level audience settings, move the Use my campaign level settings slider to the right. Define the locations you want to target. In the Locations text box, start typing the name of a country, state, city or Nielson Designated Marketing Area (DMA) that you want to target. If you want to set up negative geographical targeting (a list of countries that you do not want to target), click Advanced settings and type the name of the countries, states, cities, or DMAs where you do not want your ad to serve. To go live with an ad group or pause an ad group. From Yahoo Native & Search, click the Campaigns tab. 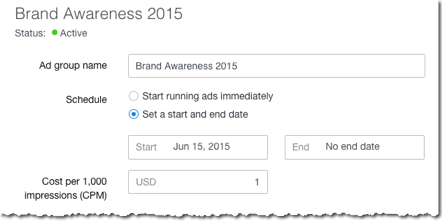 Select the campaign associated with the ad group you want to enable or pause. From the list of ad groups, select the ad group you want to enable or pause. Select Enable or Pause from the Actions menu. If you no longer need an ad group, you can delete it. Select the campaign associated with the ad group you want to delete. From the list of ad groups, select the ad group you want to delete. Select Delete from the Actions menu. Use the dimensions dropdown at the top of the adgroups table. Select the dimension of your choice. To remove a remove a dimension, select None in the dropdown. Some dimensions have different date range limitations than others. You will be notified of the limitations when you select a dimension. Total metrics are available at the bottom of the table. Totals for performance metrics are displayed in their respective columns in the total row. 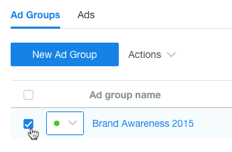 The total number of ad groups within the account campaign is displayed next to the label Total ad groups.